Drew Brees is just 6 feet tall, was barely recruited in high school and doubted after a 2005 shoulder injury. Now he is the NFL's all-time passing leader. Track his path to 71,968 yards. After being drafted with the first pick in Round 2, Brees, 22, plays in just one game as a rookie with the Chargers. He comes off the bench to replace an injured Doug Flutie. The first time he drops back to pass, he fumbles (and recovers). But he rallies and leads the Chargers back from a 19-0 deficit. His first completion is a 7-yard pass to RB Terrell Fletcher. And his first touchdown pass is a 20-yarder to WR Freddie Jones that gives San Diego a 20-19 lead before a 25-20 loss. Brees earns a starting job in his second season -- and he wins his first four games, including a 21-14 victory over the reigning Super Bowl champs and a fellow young quarterback named Tom Brady. He ends the season with 3,284 yards, 17 touchdowns and 16 interceptions. In five meetings between the future Hall of Fame QBs, Brees holds the advantage over New England's Tom Brady in multiple categories. Brady does have the lead in Super Bowl titles, 5-1. The Chargers quarterback completes a 17-yard pass to tight end Antonio Gates in the third quarter of a Week 4 loss at Oakland, the start of a prolific pairing. Brees and Gates hooked up for 180 catches, 2,279 yards and 23 touchdowns from 2003 to '05. Brees is stuck on this number, 4,955, for six weeks after he gets benched during a Week 9 loss at Chicago and temporarily loses his job to Flutie. The Chargers started 1-7, and Brees wrote in his autobiography that he was "more disheartened than I have ever been" during that stretch. This game has long been a career turning point for Brees. After a 1-2 start and some early struggles in Week 4, coach Marty Schottenheimer tells Brees he is one drive away from being replaced by first-round draft pick Philip Rivers. Brees responds by leading the Chargers to a 38-17 rout and a 12-4 record. He makes his first Pro Bowl and is named the NFL's Comeback Player of the Year. The makings of a rivalry were all there when the Chargers made a draft-day trade in 2004 to bring in the quarterback out of NC State, though it never turned into that, as Rivers would spend two years behind Brees. Here are their numbers with the Saints and Chargers, respectively. Brees' tenure in San Diego ends in devastating fashion when he suffers a 360-degree labrum tear and rotator-cuff damage in his throwing shoulder while trying to recover a fumble. The Chargers finish 9-7, and they're willing to let Brees go since they have Rivers. Only the Saints (with first-year coach Sean Payton) and Dolphins court Brees in free agency. But the Dolphins bow out over medical concerns while the Saints offer a six-year, $60 million deal with $10 million guaranteed. "All expectations were that he had a career-ending shoulder injury. But he had such a good work ethic ... He was an unbelievable comeback. And he's still playing." Brees' first completion with the Saints is an 11-yard pass to rookie RB Reggie Bush on third-and-10. His first touchdown pass is a 12-yarder to rookie WR Marques Colston in the third quarter. And the Saints kick off with a stunning 3-0 start. A funny side note: Brees still has a ball commemorating that first TD pass -- and Colston's first name is spelled wrong. Colston was an unheralded seventh-round pick, but he went on to catch 706 passes for 9,709 yards and 72 TDs from Brees. Brees' career with New Orleans stands out in a big way from his short time in San Diego. Here are his stats with each team, including 13 seasons and a Super Bowl title with the Saints (at left) and five seasons with the Chargers. Brees ends his first season in New Orleans with a career-high 4,418 passing yards (a number he has since topped nine times). And the Saints stunningly reach the NFC Championship Game just one year removed from a 3-13 season before losing at Chicago. 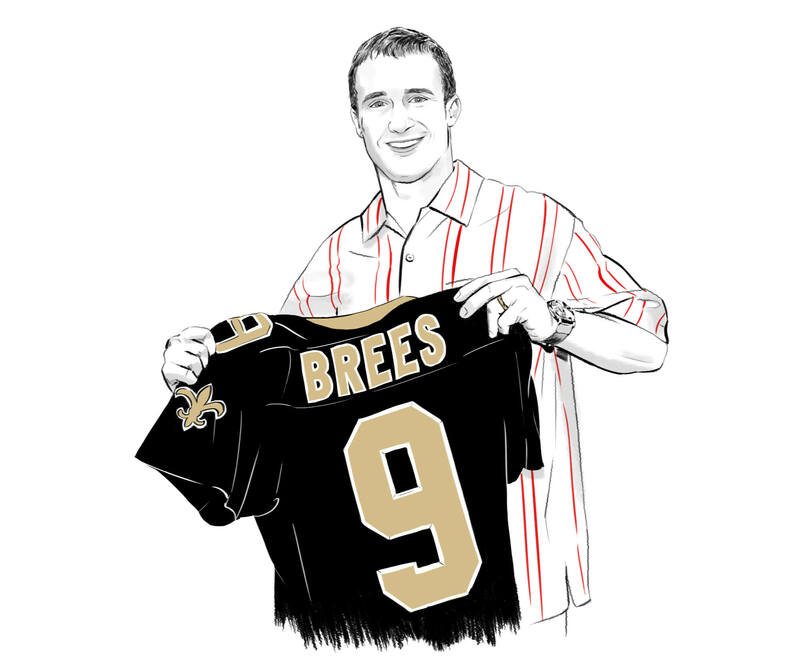 Brees is a co-recipient of the NFL's Walter Payton Man of the Year award to recognize all that he did both on and off the field to help revive New Orleans after Hurricane Katrina. "A lot of it is feel as opposed to actual vision. People may not believe it, and maybe it's different for taller guys -- I don't know -- but there's times where I don't see it.  I can't see it visually with my eyes. But I can feel it." Traveling across the globe, Brees gets his first chance at revenge against his former team at London's Wembley Stadium. He throws for 339 yards, three touchdowns and no interceptions in a 37-32 win. Brees has never lost to the Chargers in three meetings since he left the team. Brees becomes just the second player in NFL history to throw for 5,000 yards in a season -- falling 15 yards short of Dan Marino's former record of 5,084 yards. Brees goes on to surpass 5,000 yards four more times in his career (5,476 in 2011, 5,177 in 2012, 5,162 in 2013 and 5,208 in 2016). No other quarterback has ever done it twice. The Saints quarterback has five of the nine 5,000-yard passing seasons in NFL history, last surpassing the mark following the 2016 season. A sign of great things to come: Brees starts the season with the first six-TD performance of his career, throwing for 358 yards in a 45-27 rout of Detroit. And the Saints keep rolling after that, starting 13-0 before ultimately winning the first Super Bowl in franchise history. 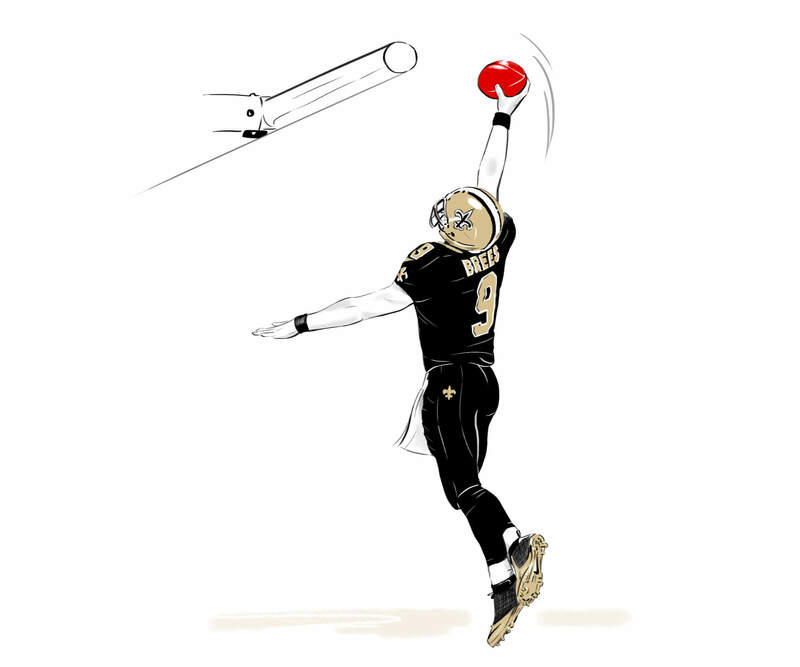 The 6-foot-tall Brees leaps over the goal line for a first-half touchdown and shows off his hops again by dunking over the goal post following a second-half touchdown run. "There are times in a game when a team needs an emotional lift ... and I felt like I had to do something to get everybody hyped up. Obviously, you don't see that a lot from a 6-foot guy." This proves to be the signature performance of Brees' career -- in the regular season, anyway. On MNF against Brady, Brees scores a perfect passer rating of 158.3, completing 18 of 23 passes for 371 yards, five touchdowns and zero interceptions in a 38-17 win. It remains the only perfect passer rating of Brees' career, and some analysts have called it the best single-game statistical performance in NFL history considering the stakes and results. "He's got everything it takes. I think that's why he's thrown for 5,000 yards five times." Brees sets the NFL record for single-season completion percentage (70.62) -- a record he later topped in 2011 and again in 2017. Then he is nearly perfect in the playoffs, with eight touchdowns and zero interceptions as he becomes the Super Bowl MVP. His signature drive comes in the fourth quarter of New Orleans' 31-17 win against the Colts, as he completes all eight pass attempts to eight different wide receivers, including a touchdown to Jeremy Shockey and a two-point conversion to Lance Moore. 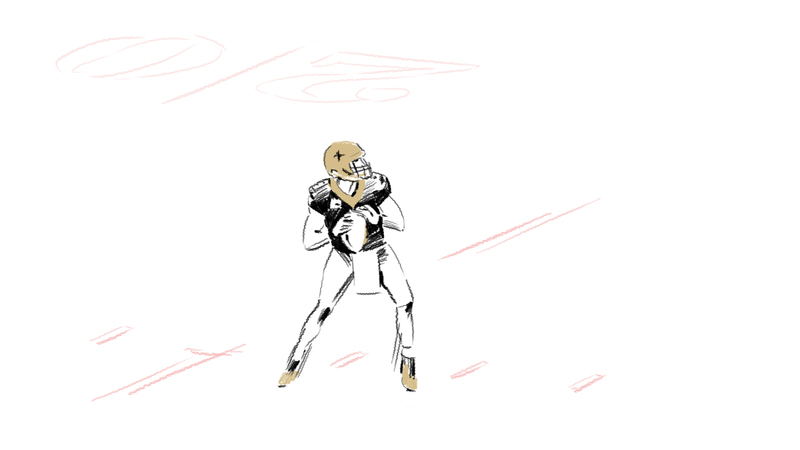 Brees completes his first pass to rookie tight end Jimmy Graham -- another former basketball player like Gates. The duo went on to combine for 383 catches, 4,725 yards and 51 touchdowns from 2010 to '14. Here are all the wide receivers who have had 1,000-yard seasons on passes from Brees. The Saints' offense sets an NFL record with 7,474 yards in 2011 that stands to this day. They were never more dominant than this Sunday prime-time game, beating Indianapolis 62-7. Brees has five TDs and completes 31 of 35 passes for a completion percentage of 88.6 -- the highest of his career. Here are all of the QBs on the Saints' 2018 schedule. Their projections are based on each of their career passing yards per game as a starter and assuming no missed games. Not only does Brees break Dan Marino's single-season passing yardage record -- he shatters it. Brees passed Marino in Week 16 before finishing the season with 5,476 yards, 46 touchdowns and 14 interceptions. "There may be only one name that goes in the record book, but it's all about you guys," Brees says during a postgame speech in the locker room, crediting everyone from teammates to coaches, owners, equipment managers and trainers. The Dolphins' Marino carries the single-season passing yardage record for 27 long seasons -- until Brees passes him in 2011. Here's a look at each of their record-breaking seasons. This becomes a lost season for the Saints in the wake of Bountygate, but Brees sets one of his most impressive records along the way, breaking Johnny Unitas' 42-year-old mark of 48 straight games with a touchdown pass. Brees breaks it with a 40-yard TD pass to longtime Saints WR Devery Henderson -- against his former team, the Chargers, no less. Brees throws for 257 yards, five touchdowns and zero interceptions against Pittsburgh. He has thrown for at least five TD passes 10 times in his career (most in NFL history) -- and he ranks fourth in NFL history with 496 TD passes for his career. He's 43 behind Manning for first place all time. In nearly half of the games Brees has played in during his 18-year career, he has thrown for a touchdown or two. Here is a breakdown of Brees' TD games. 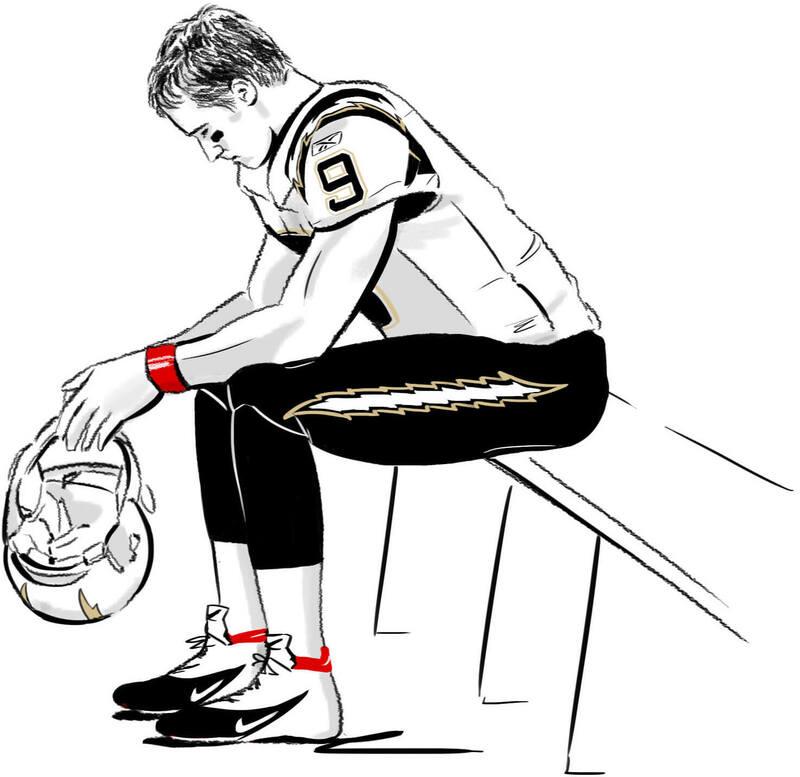 For the first time since high school, Brees misses a game because of injury after suffering a bruised rotator cuff. Brees returns the next week and still leads the NFL with 4,870 yards for the 2015 season. Brees provides one of the most memorable moments of his career, becoming the eighth player in NFL history to throw seven touchdown passes in a game to outduel Eli Manning and his six TD passes in a 52-49 thriller. Brees completes 39 of 50 passes for 505 yards -- the second-highest total of his career. The total number of games Brees threw for each yardage category, and where he ranks among quarterbacks all time in that category. Brees opens the season with the longest pass of his career, a 98-yard touchdown to dynamic speedster Brandin Cooks. The duo also connects on an 87-yard TD later this season -- the second-longest pass of Brees' career. The Saints return to the playoffs after a three-year drought, thanks to one of the best rookie classes in NFL history. Brees finishes with the fewest attempts (536), yards (4,334), touchdowns (23) and interceptions (8) of his 12-year tenure in New Orleans -- while setting the NFL record for completion percentage for the third time (72.0 percent). Brees also ranks first in NFL history for career completion percentage at 67.1 percent. Brees proves he has some "Superman" left in him when needed, leading the Saints to a thrilling 43-37 overtime victory with three TD passes and two TD runs -- including an improbable spin move out of a sure tackle late in the fourth quarter. Brees has had 42 comebacks in the fourth quarter or overtime in his 18-year pro career. For the past three seasons, this record has been held by two-time Super Bowl champ Peyton Manning, who retired in March 2016 after 18 NFL seasons. As the 39-year-old Brees continues on in his 18th season himself, here are the career passing yards by age for each quarterback. A look at the NFL's career passing yards leaders, their total yards and the years they each held the record. Brees breaks the record in spectacular fashion -- with a 62-yard touchdown pass to rookie receiver Tre'Quan Smith in front of the prime-time national audience on Monday Night Football and the raucous home crowd in the Mercedes-Benz Superdome. 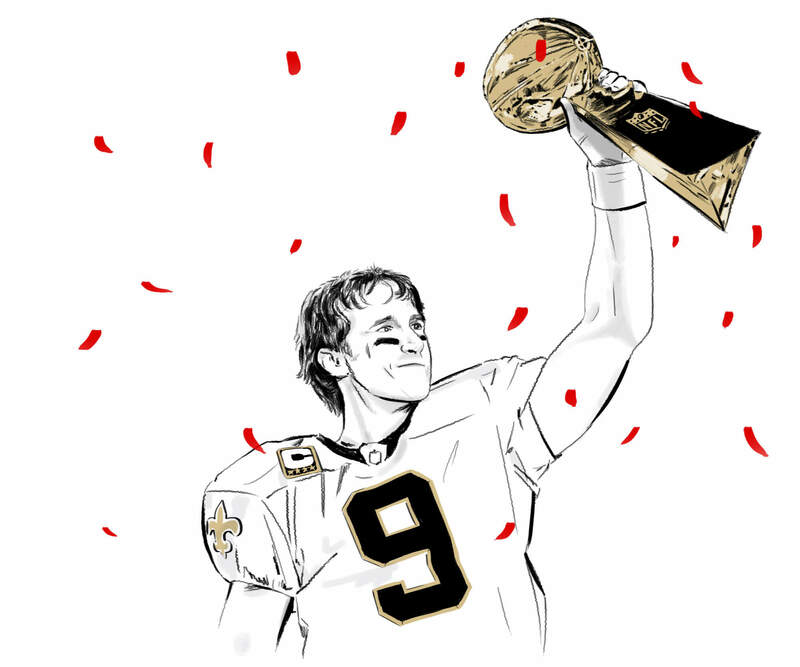 As planned, the NFL stops the game to recognize the achievement as an emotional Brees waves and blows kisses to the crowd. He then delivers the ball to Pro Football Hall of Fame president David Baker on the sideline and shares hugs and kisses with his wife Brittany, kids and coach Sean Payton among others on the sideline. 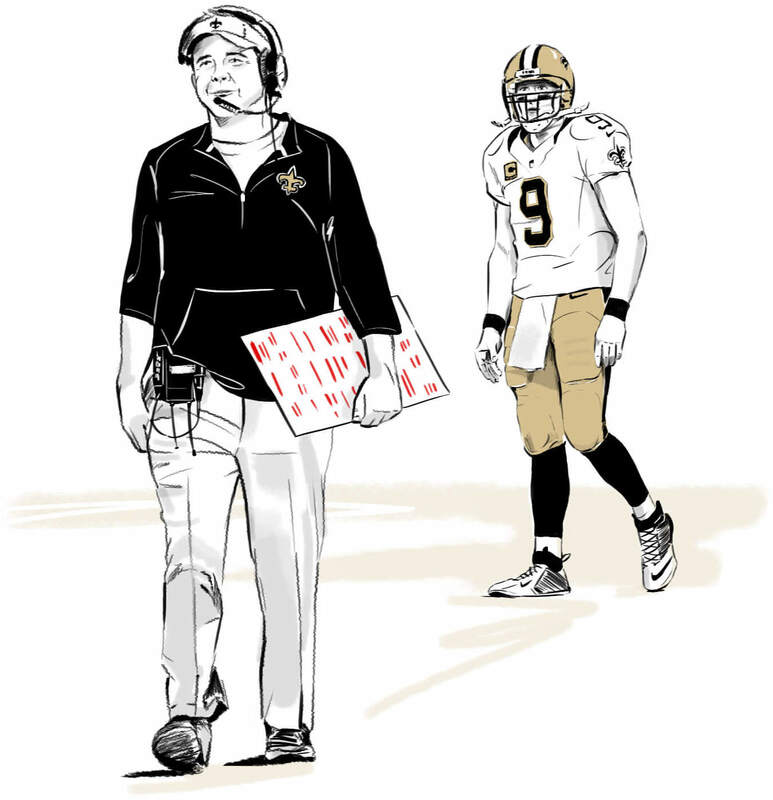 What if Brees was never a Saint?